This jumbo-sized shark is really hungry today and could use a few caveman snacks. This shark is very hungry and he’s ready to take a huge bite out of LA. Let the feeding frenzy begin! Even piranhas like to enjoy themselves during the holiday season. This super shark is super hungry! Help him take a big bite out of The Magic City. This fearsome piranha is incredibly hungry this afternoon. Could you find him lots of tasty humans to eat? 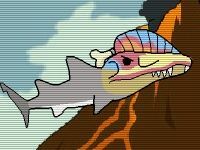 Wreck havoc across these peaceful waters as the most dangerous sea creature ever, the Medieval Shark! 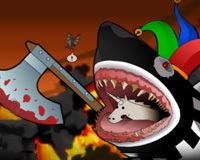 Collect power-ups to deal more damage and cause more chaos in this awesome arcade game! This champion weightlifter is taking on a whole new challenge. Join him on his next global tour. Using your choice of color, you can make sharky look niceâ€¦or menacing!